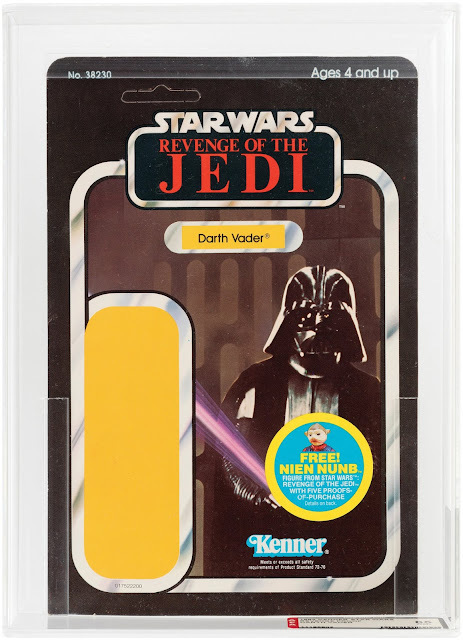 Having previously covered MPC model kits released under the Star Wars and Empire Strikes Back banners, I suppose we're left with Return of the Jedi. Do you find ROTJ product a little disappointing? I often do. Why is that? I think it's because, with the release of Return of the Jedi in 1983, Star Wars arrived at peak commercialization. While Star Wars and merchandising were a thing from the get-go, there wasn't a lot of product on store shelves when Star Wars hit theaters in 1977. 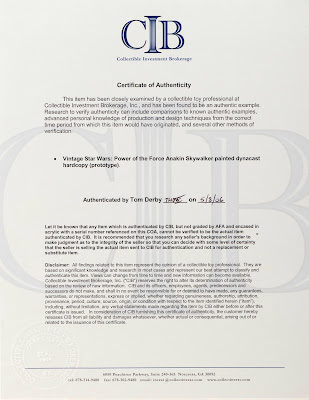 And the range of licensees that agreed to produce merchandise in conjunction with The Empire Strikes Back was, all things considered, pretty limited; it was a sequel, after all, and no one knew how it would perform commercially. Return of the Jedi changed all of that. Right from the start stores were clogged with ROTJ-branded merch. And the movie seemed designed to sell that merch; many looked at it as a big-budget toy commercial. 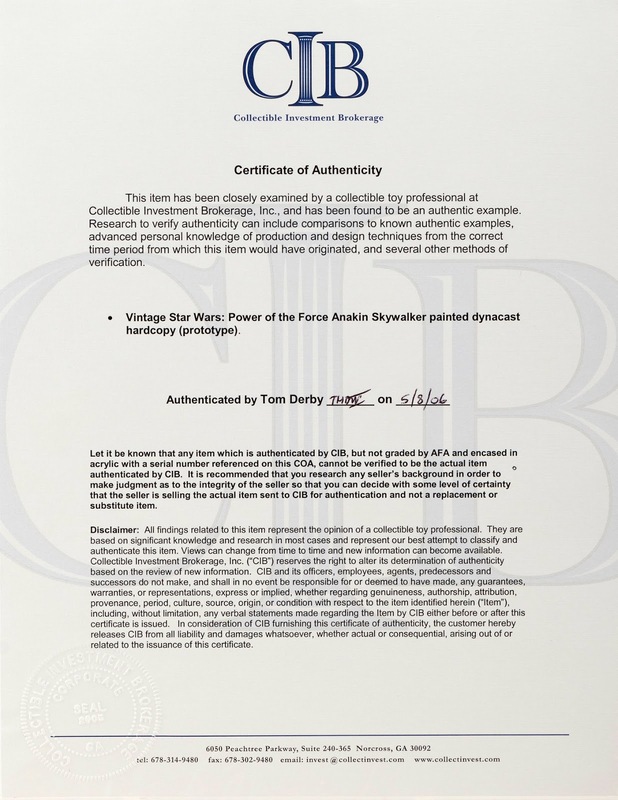 Moreover, doesn't it seem like some of the companies to which Lucasfilm granted ROTJ licenses were somewhat unworthy? I can think of a few Star Wars and Empire products that were junk. But tons of Jedi trinkets qualified as outright crapola. In fact, I'm pretty sure that Adam Joseph Industries was licensed as the exclusive manufacturer of Star Wars crapola. Maybe we shouldn't hold them responsible. If they had made something nice, they probably would have violated their license. My gut reaction is, of course, unfair. 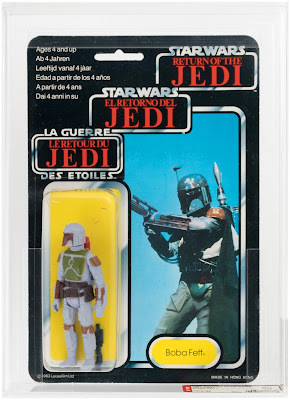 By and large, the kits in MPC's ROTJ line were just as nice as the ones they'd released in earlier years. Which brings us to the first kits I'll be discussing in this piece: the ones originally developed for the Star Wars or Empire lines and re-released in ROTJ packaging. As the above catalog image shows, the line contained four such kits. Naturally, one of them was the Millennium Falcon. Although in Return of the Jedi the Millennium Falcon was tarnished somewhat by its association with Nein Nunb, it played a significant role in the offensive against the second Death Star. 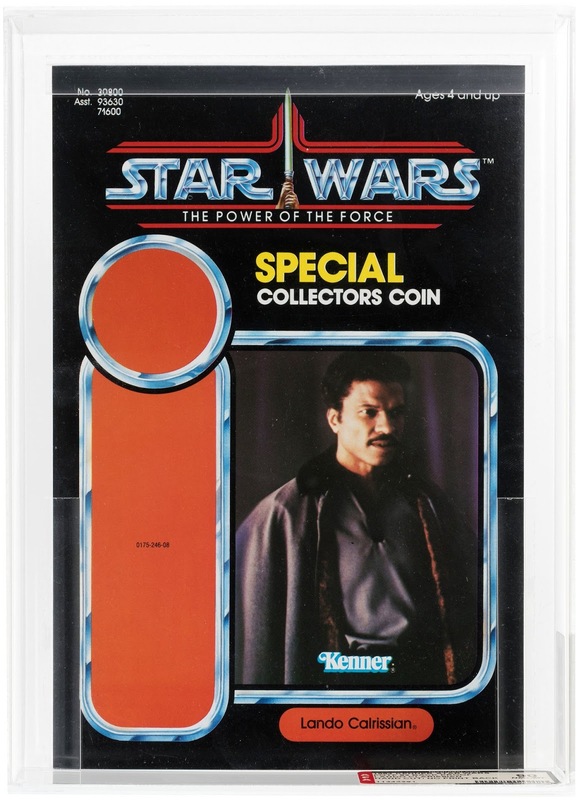 Absent the Falcon, how would screenwriter Lawrence Kasdan have occupied Lando? 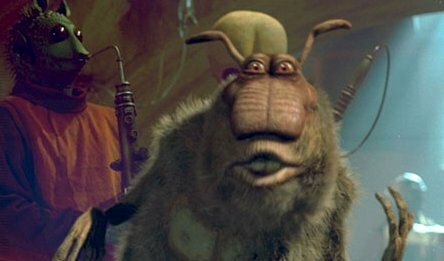 Putting him on Endor wasn't an option, because there's no way that Lando would have tolerated the Ewoks' bullsh*t.
In fact, had Lando been allowed on Endor during the lead-up to the battle, he probably would have commandeered the Ewok Village as he did Cloud City. 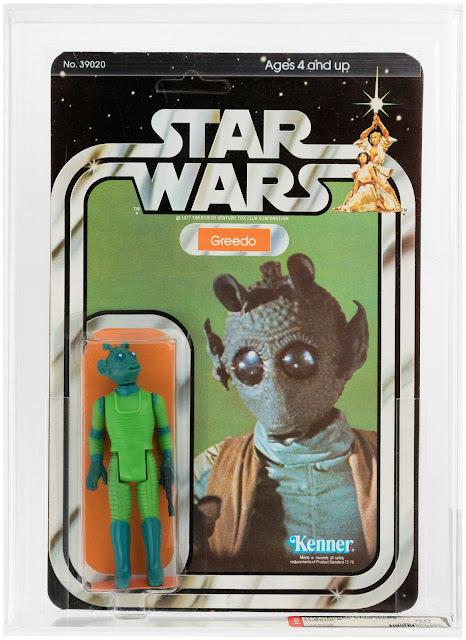 He would have made the Ewoks worship him rather than C-3PO. He would have made Logray into a furry child-sized Lobot. Another re-release was the X-Wing Fighter. By now you've probably noticed that, in designing the packaging for the ROTJ line, MPC substituted photography for artwork. Personally, I find this choice depressing, as I loved the artwork-heavy look of the Star Wars and ESB lines. But the photographic approach did have one benefit: It displayed the actual product front and center in all its movie-authentic glory. Consumers certainly knew what they were getting when they purchased one of these kits. 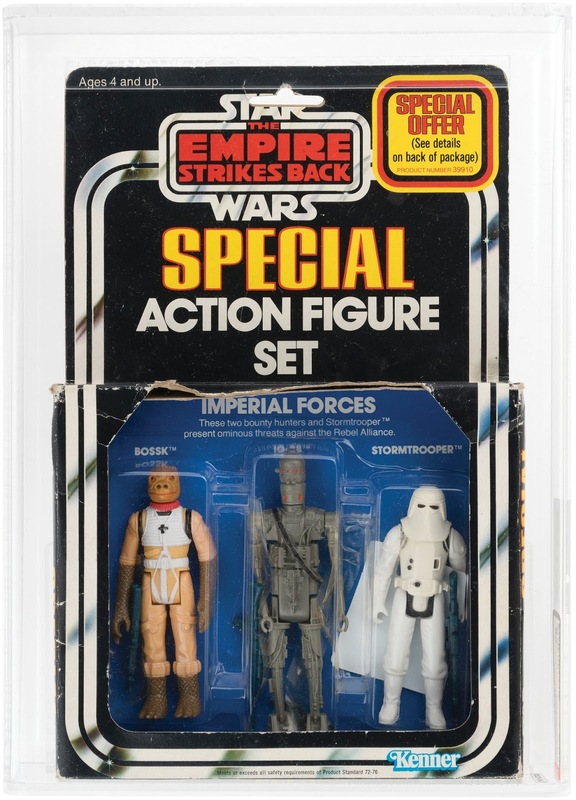 Actually, I partially withdraw that last statement: On the boxes for the R2-D2 and C-3PO kits, both recycled out of the Star Wars line, MPC utilized actual movie photos. The R2-D2 box shows the droid engaged in a staring contest with Wicket. Investing the obvious with unrivaled poetic force, the MPC catalog claims that R2-D2 is "cantankerous" and "cylindrical." And what would a R2-D2 model be without a corresponding kit based on C-3PO? The MPC catalog claims that "The MPC [C-3PO] kit will become a real favorite with the kids." Hmmm. I suspect MPC may have overstated the appeal of C-3PO. The final re-release was the AT-AT. Perhaps you remember that the AT-AT appears in Return of the Jedi for about three seconds, in a high-angle effects shot showing the landing pad adjacent to the shield generator. 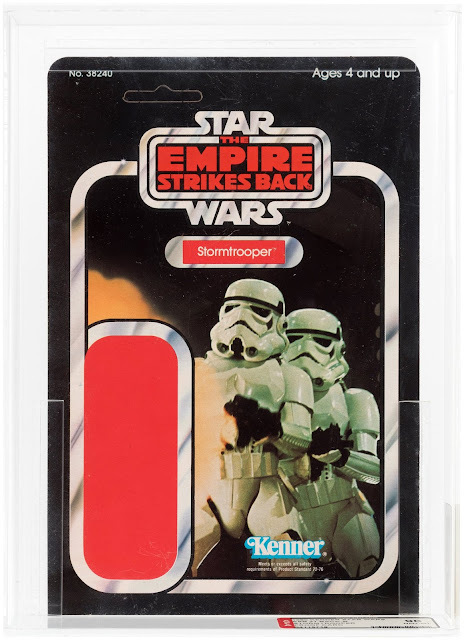 These three seconds were a blessing to licensees like MPC and Kenner, as they allowed them to re-issue their expensive-to-develop AT-AT products in updated packaging. Is it me or is MPC's box design for the ROTJ AT-AT among their weirdest? In it the AT-AT herd seems to be solemnly marching behind their leader, as he leads them to the fabled AT-AT Graveyard. 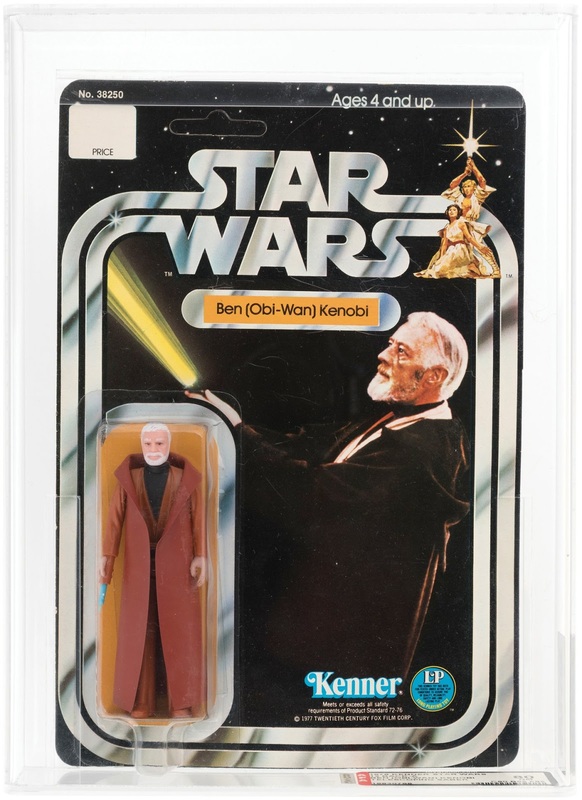 What big new releases adorned the ROTJ line? The first we'll discuss is Shuttle Tydirium. The largest new vehicle in the MPC line, the Shuttle featured moving wings and cannons, and a ramp that descended to the ground, just like the one in the movie. According to the above catalog description, it also included a Darth Vader figure, though I was unable to find a photo of it. Note that whereas the catalog refers to the product as the Imperial Shuttle Tydirium, the box omits the "Imperial." 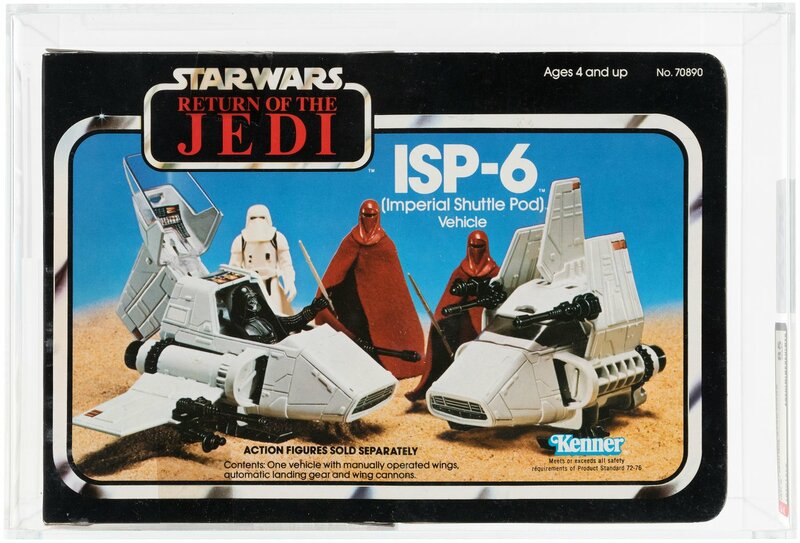 Kenner did the opposite: Their toy version of the vehicle was called the Imperial Shuttle. Does Shuttle Tydirium sound a little Star Trek-y to you? It does to me. The second big new release was the Speeder Bike, a faithful recreation of the hovering zoomy things that everyone remembers from the chase scene on Endor. At 11 inches long, the Speeder Bike was comparable in size to the X-Wing and AT-AT. Consequently, the three products shipped together as part of the same assortment. As I never miss an opportunity to prove my nerdlinger credentials, allow me to present a photo of an example of this kit that I built in the 1990s. Dude, check that drybrushing. And the moss. You may remember that, in my piece on MPC's ESB offerings, I discussed two snap-together dioramas representing broad scenic areas located on the ice planet Hoth. Jabba the Hutt's weird and wonderful throne room provided the company with an opportunity to release a similar item as part of their ROTJ range. Happily, the product's box utilized a full-on painting, the only item in the ROTJ line to do so. It's a nice painting, too, though it's spoiled somewhat by the inset photographs of various JabbaMuppets. Called the Jabba the Hutt Throne Room Action Scene, the kit boasted 29 figures, including fan favorite Joh Yowza. I sh*t you not, Joh Yowza is there, just hanging out in a corner as he prepares to bust a rhyme, reveal himself as Snoke's alter-ego, or whatever the hell a Joh Yowza does when he wants to justify his rep as the coolest character in Star Wars. Jowza is delivering more than lyrics in his entertaining style -- he's communicating joy. If I didn't hear it myself with my own ears, I'd swear it's telepathic. But it's not. It's an actual pitch that affects me and makes me happy. Many species I've observed -- even if they don't like the sound of the voice -- will end up clapping and cheering when Joh Yowza finishes a set. I suppose "Jowza" is to "Joh Yowza" as "Bird" is to "Charlie Parker"? Regardless, it's nice to know that Jowza communicates the joy of his music telepathically rather than -- uh -- musically. "Pootie don't need no words, don't even need no music!" A new component of the MPC line of 1983 was an assortment of mid-sized snap-together kits representing prominent ROTJ spaceships. There were four in the original assortment: the A-Wing Fighter, B-Wing Fighter, X-Wing Fighter, and TIE Interceptor. MPC described the B-Wing Fighter as having "the most spectacular flight characteristics of any movie space vehicle." Okay, I guess I buy that. 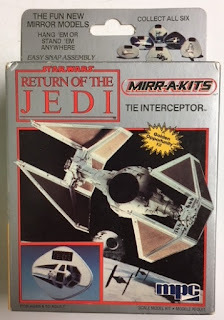 Because Kenner didn't get around to releasing a toy version of the A-Wing Fighter until 1985, MPC's model-kit version was the only game in town for a couple of years. 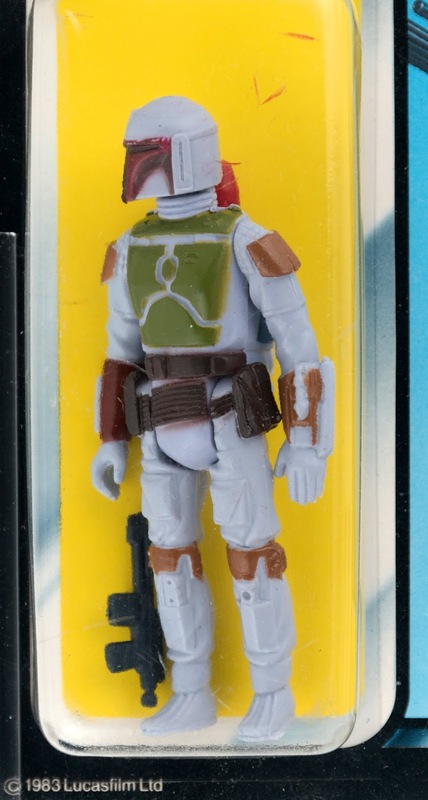 It featured a pretty cool-looking pilot figure. Here's the TIE Interceptor, universally recognized as the trying-too-hard-to-be-cool version of the TIE Fighter. Rounding out the assortment was this smaller version of the X-Wing Fighter. Whereas the boxes of the other snap vehicles depicted scenes over the forest moon of Endor, beside which the second Death Star loomed menacingly, the ship on the X-Wing box is approaching what appears to be the most boring planet in the universe. The snap vehicle line was expanded in 1984 to make room for two new entries, the Y-Wing Fighter and AT-ST. The box of the Y-Wing features a pretty rad battle scene; it might represent the best photographic box art in the line. Given the amount of screen-time devoted to the AT-ST in Return of the Jedi, it's somewhat surprising that MPC waited until 1984 to release a model-kit version of the vehicle. The box appears to feature a shot of the MPC kit that has been composited into a scene from the movie. The year of 1984 also saw new varieties of model kit join the MPC line. One of them was a product range known as Structors. Structors were model kits that included small motors to allow them to walk. There were three pieces in the line, representing C-3PO, the AT-ST, and the AT-AT. Structors' low price and obvious sales hook (they move!) made them ideal impulse buys -- though I suspect they weren't a smash hit. I can't recall coming across a loose example. The second entirely new product was known as Mirr-A-Kits. Mirr-A-Kits were tiny half-models of vehicles that, when affixed to small mirrors (included, natch), kinda sorta maybe almost looked three-dimensional. Sound horribly lame? That's because you're not suffering from a debilitating head injury. There were six pieces in the line, all representations of vehicles that MPC had released in their snap- or glue-together lines. In fact, if you look closely, you'll see that some of the Mirr-A-Kit packaging reuses art from previous releases. Well, that wraps up our three-part look at the Star Wars model kits released by MPC in the United States. What happened after 1984? Good question. 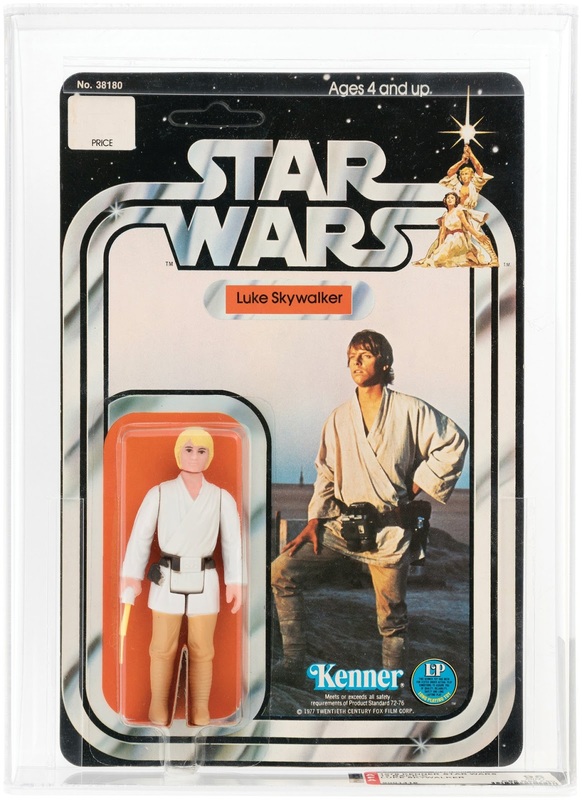 In 1985, MPC considered following the lead of Kenner and continuing the production of Star Wars merchandise, even though, for the most part, Star Wars had ceased to be a presence in movie theaters. They even considered using a familiar logo. That's right, the 1985 MPC catalog utilizes Power of the Force branding. 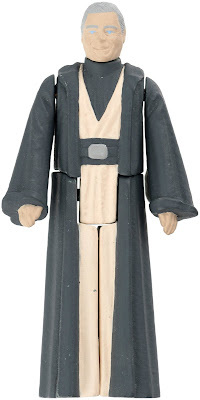 However, no Power of the Force Star Wars model kits made it to store shelves. Instead, MPC was acquired by the Ertl Company, and Star Wars was temporarily mothballed. When several familiar Star Wars models reappeared later in the 1980s, the old MPC logo had been replaced with one incorporating the name of the new parent company. If you want to know if the model kit you're looking at is an original or a re-release, just inspect the logo. If "Ertl" is present below the "M," it's not the original MPC product. 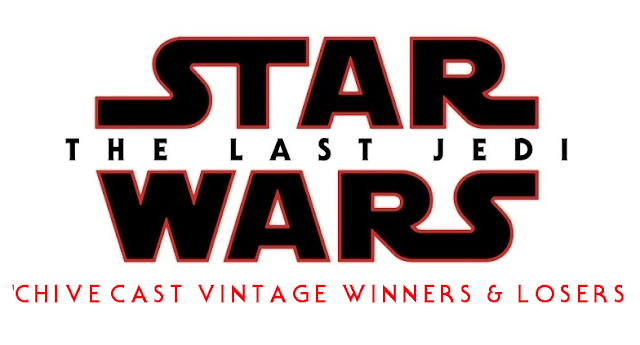 Skye and Steve declare the Vintage Winners and Losers from The Last Jedi movie. It is filled with spoilers, so if you haven’t seen the movie..do not listen to it! “Which vintage Star Wars characters and collectibles were made more or less relevant, interesting and valuable by their representation in the second part of the postquel trilogy?" We give our top 13 winners and losers which all somehow ended up working perfectly in paired categories. Like the movie itself, however, things are not as clear as they may seem as many winners are revealed to have also lost and visa versa. More question marks than exclamation points in this movie! Skye does most of the blabbering on this episode, so you may want to put on your anti-gravity boots to resist the sheer power of the blowhard force coming at you from Hothchester. Somehow Steve went the entire episode without mentioning the fact that he wrote an amazing blog write up on the movie at his website www.starwarsatthemovies.com. C’mon, Steve, self promote a little! So come and listen to our take on Rian Johnson’s vision and its impact on the Vintage Star Wars hobby. The Number 8 loser will anger you! The Number 7 winner will move you! The Number 11 winner will bore you! The Number 2 loser will mystify you! And the Number 1 winner will shock you to the very core and leave you more surprised than the movie itself. Join Skye and Steve as they force Skype like Rey and Kylo about The Last Jedi on the 87th Vintage Pod.